Happy Leap Day! Well, as promised, we have more going on, and we're going to get right to it. 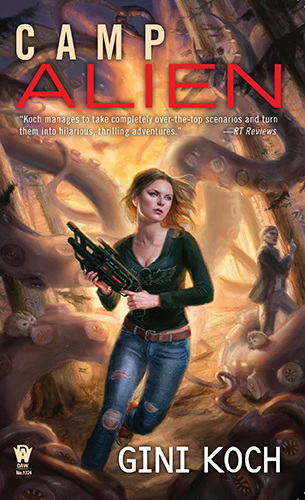 First up, in case you've missed it somehow, the cover for Camp Alien is alive, and it's epic. So, I have a special announcement about this cover. Despite how awesome it is, the artist is not who you think it is. That's right, we have a new artist for this cover and her name is Lindsey Look! I love her stuff and am thrilled that she was able to leap into the series and do such a wonderful job first time out of the gate! Next up, the Yap has been running wild. First off, check out my podcast AND videocast over at Drinking with Jason wherein I drink an entire carafe of St. Germain cocktails and Jason and I talk about a whole lot of things. After that, hit geektitude and check out the podcast with them wherein I yap about a variety of things, none of which are the same as what I yapped about with Jason, and all of which are science fiction related in some way. Then, for more general geeky fun, check out the geektitude podcast featuring Kenny Rotter from Dumbbells and Dragons. Why do you care? Kenny's my future son-in-law, so you can check out his Coolness Cred (which is high) as well as hear another fun podcast. And, if that's not enough, Team Gini's own Joseph Gaxiola has started videocasting, so check out his first one and then, as with the 'casts at geektitude and Drinking with Jason, get 'em all! After that, check out the Yap in an interview over at The Heroine Bookstore -- sorry, the contest is over, but the info is still current. And last but not least, awesome author Amy Lane asked me and several other authors to give her our go-to "author candy", so check that out over at USA Today's Happy Ever After. That's it for today, but more's definitely on the way. So let's be podcasting and vlogging readers out there as we head for lucky number 17! Peace out, my li'l gangstas, and I'll catch you on the flip side! Hey there -- I'm not dead! I know, right? I've been silent for, um, 2 months, and so I'm sure you wondered. But, hey, I warned all y'all that I was going to be less active due to deadlines. The last batch of deadlines are done, the current batch are still conceivably on time, so I'm able to kind of look up and share things. First up, I've hit the visual media a lot for Slice of SciFi. So head over there to see what I thought of Deadpool, my 5 Episodes In review of Supergirl, and hear what I and other Slice reviewers thought of The Force Awakens. Agree, disagree, or just want to share your thoughts? Join in the discussion over at Slice! If you missed seeing the me at The Poisoned Pen in December or elsewhere while I was on book tour, no worries, 'cause LiveStream has you covered. Lots of news and laughs and some announcements, all for your viewing pleasure. You wanna see the cover for Camp Alien? I knew you did! Head over to my Premieres (http://www.ginikoch.com/premiere.htm) page and check it out! That's it for today, but, trust me, more's on the way. So let's be cover viewing readers out there! Peace out, my li'l gangstas, and I'll catch you on the flip side!